I have a fair number of older tools whose cutting edges came with rough grind marks. These days, however, it is rare to see that. Most tools of any quality that are stocked by any dealer might not be ready to use, but they have at least a respectable "factory edge." The backs should be decent, the bevel ground to a good finish, and in theory the tool might even work, albeit perhaps inefficiently, out of the box. Carving tools are the exception. Most modern carving tool companies really intend for their tools to be usable right away. Ashley Iles tools, one of the first companies to offer sharp tools, deliver decent sharpness. Certainly the tools are sharp enough to get started and at least see if you like the way the tool feels in the hand. You can actually carve with the tools, but as you get more experienced, you will realize that the tools aren't as sharp as they can be, and the bevels are a little steep for some tastes. Flexcut - which we also stock in a limited number of tools, come sharp and ready to use. Ray Iles's mortise chisels are not intentionally sharp and ready to use, but the factory edge is reasonable. Considering mortise chisel work without a superb edge, they work reasonably well straight out of the box. Japanese tools as a group are now almost universally sold with a decent factory edge. This is also pretty new. Traditionally in Japan, one would purchase the tools from the toolmaker, ground only and without a handle. You would either take them to a handler for handles, or fit the mushrooming of the rear hand hoops yourself. The actual sharpening was up to you. I am glad that all our chisels come with a good factory edge. I don't think any of them are ready to use, but for a lot of customers who don't have grinders, having a tool pretty close to usable saves hours. Our veneer saws are sharp and ready to use. 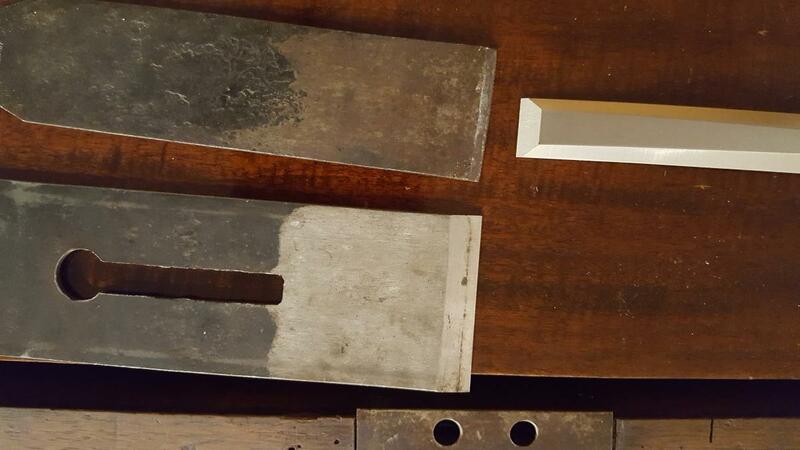 We found that our combination of hand and mechanical sharpening methods produced a far better edge than most people could easily do themselves. Having sharp saws means you can hit the ground running. It seemed to make more sense spending time veneering than figuring out how to get a veneer saw sharp enough to cooperate. In the second to last picture in this blog here are three never used edge tools as they came from the factory. In the last picture are the same tools flipped over. Clockwise from the top. A German Wilhelm Schmitt toothing iron from the mid-19th century. Yes! This is the same company known today as Two Cherries and the iron is stamped with the two cherries mark (see picture at top of blog). 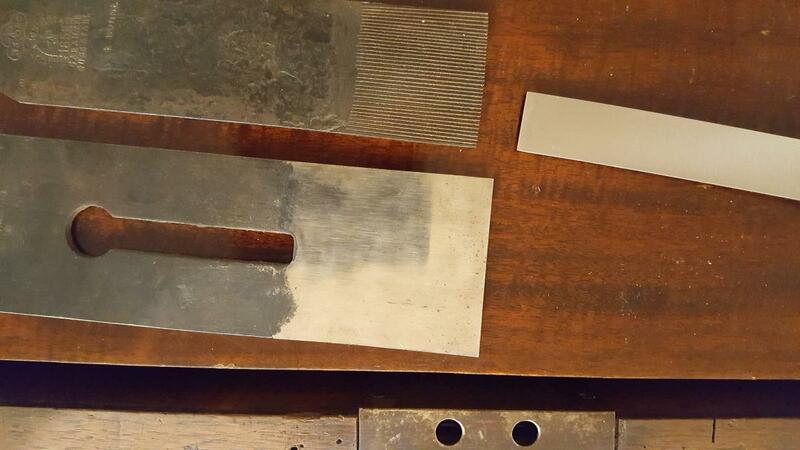 There are no grind marks, but there are file marks on the bevel. I think it's a laminated iron so filing the bevel below the toothed area would work. A 1960's Stanley 720. The grind marks on the bevel are fairly fine, although the finish on the body of the chisel is even finer. 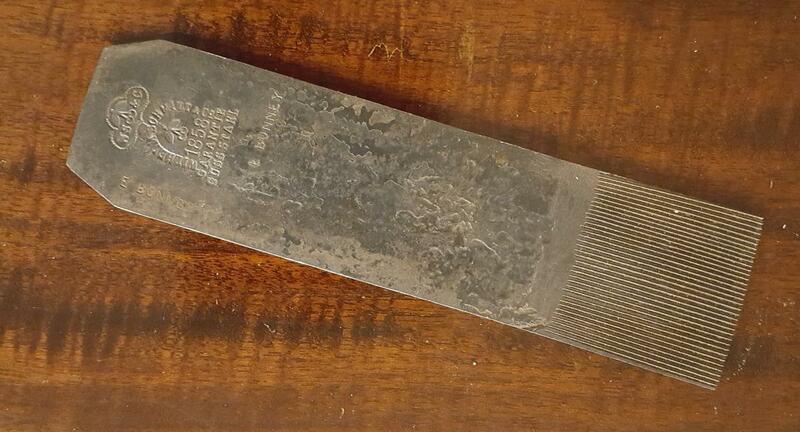 This chisel was made on production grinding machines that were invented just before WWII. Finally a 19th century Buck Brothers wooden plane iron. The bevel on this is close to a mirror finish, but not quite: there are regular fine grind marks evenly along the bevel. If you hold a rule against the bevel, you can see a very slight hollow from having been hand ground against a very large diameter wheel. When the iron is flipped over, we can see the ridges of the toothing iron. This iron was designed to successfully plane weirdly grained wood. The marks look forged in, but I am not sure how. Interestingly, they aren't symmetrical - they are more like a sawtooth. Again I don't know why. The back of the Stanley 720 has even, consistent, grind marks of a large rotary horizontal tool grinder. Finally, on the Buck Brothers iron you can clearly see the weld marks of the laminated blade. The back is strangely polished and shiny. The back seems flat left to right but there is a definite hollow from front to back. The hollow means that it will be really easy when sharpening to get an even line of flat right at the cutting edge. If I had to draw a conclusion, it would be that the tool makers made their tools with as close to a finished edge as time and the technology of the time would allow. When I was young and ignorant (1960 is a great example) I barely knew what sharp was. At 71, I expect to sharpen new tools except when told otherwise, And even then I'd like to know what the edge is like; it might have a bevel, a micro level, or a straight Scandinavian grind. What angle is that bevel, and if I use 3M film for fine dressing, can I avoid messing it up? I'm one of those people who like to sharpen. It's very relaxing. It's nice and quiet there. This is a very interesting article. I do have a question though. I wouldn't even attempt to sharpen my hand saws, but I also can't find any place around me that does. I live in San Diego. Any suggestions? Watch Paul Sellers sharpen on his utube or website. You will discover it’s not as daunting as you now think, and it’s nice to be able to tune them up from time to time. Connect with the San Diego Fine Woodworkers Association at sdfwa.org. You'll find someone in the group who would be happy to teach you to sharpen. They also offer classes at time. Apparently Robert Sorby has a loose definition of "factory edge". I purchased 1/4 and 1/2" paring chisels thru a 3rd party Amazon vender out of Ohio whose edges looked like they were formed with a hatchet. Because they came with plastic protective tips on the end, I have to believe that they were shipped that way from the factory. Fortunately, they cleaned up easily with not much effort and are actually pleasurable to use.